Tom Lee opposed transportation tax. Now his wife is the judge in case against it. 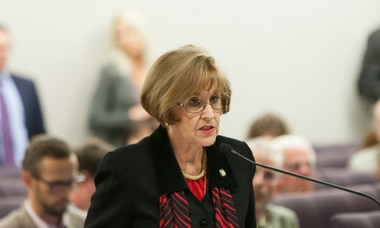 Hillsborough County Commissioner Stacy White filed a lawsuit Tuesday seeking to invalidate the 30-year, $15.8 billion transportation sales tax that voters approved in November. TAMPA — A lawsuit challenging a new transportation sales tax has already hit a snag: the judge assigned to the case is married to one of the tax's vocal opponents. 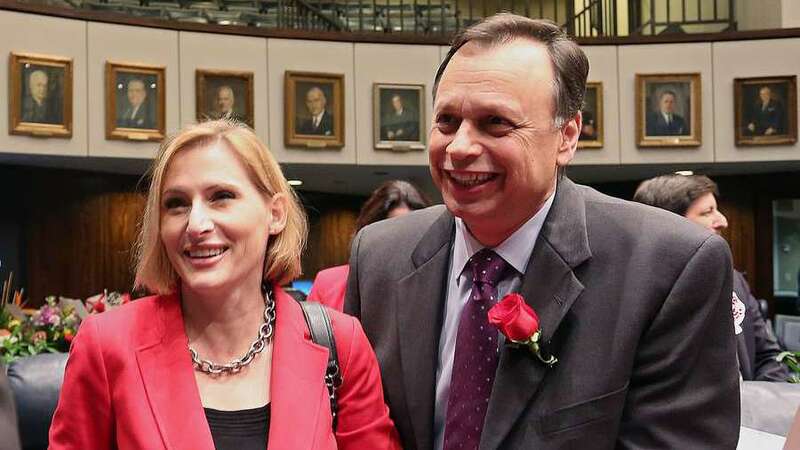 Hillsborough County Circuit Judge Laurel Lee's husband is Sen. Tom Lee, R-Thonotosassa, who campaigned against the transportation tax. She was assigned the case challenging the charter amendment on Tuesday. Hillsborough County Commissioner Stacy White filed a lawsuit Tuesday seeking to invalidate the 30-year, $15.8 billion transportation sales tax that voters approved in November. The lawsuit specifically questions whether a new citizens committee that will oversee how the tax is spent usurps the authority of elected officials. Laurel Lee was assigned by a computer that uses an algorithm to select from about 11 eligible judges for civil cases, spokesman for the clerk's office Tom Scherberger said. "It's a random process," Scherberger said. Tom Lee, who served as Florida Senate President from 2004 to 2006, campaigned against the transportation tax. His picture and quotes were used on campaign mailers slamming the tax as doing "almost nothing for people in the suburbs and rural areas." The senator also sent text message blasts urging people to vote against the referendum. "Special interests bankrolling ads for new $15B tax that benefits them but won't fix our roads," one text read. The senator said he plans to continue this battle in Tallahassee if the lawsuit is unsuccessful and the charter amendment is upheld. "If this is allowed to stand, there will be legislation to make sure this doesn't happen again," Lee said. "If the statute is ambiguous enough to let people drive a truck of this size through (the state law), then we need to fix it." When asked Tuesday afternoon whether Laurel Lee's selection for the case was a conflict of interest, Lee said he had not had a chance to discuss the assignment with his wife and would defer to her for answers to that question. "I wouldn't worry about that for one second," Lee said. "She's going to do the right thing." Laurel Lee did not return calls for comment Wednesday. Mike Moore, spokesman for Hillsborough's Circuit Court, said judges are precluded from commenting on cases. In situations where a judge was assigned to a case where there was a conflict of interest, Moore said that judge could choose to recuse him or herself. Attorneys in that case can also request a new judge if they think a client's interests are going to be harmed because of a judge's history or previous actions, Moore said. However, the attorney would need to prove there is a legitimate conflict of interest. Usually that happens pretty early in the case, Moore said. Lee said he shared his concerns about the legality of the charter amendment with White in "a lot of conversations…in a variety of settings." White said he certainly talks with Lee on occasion, but does not remember anything coming up about the legality of the referendum. "I don't recall really getting into any nitty gritty about this potential suit," White said. Lee said he's had "some involvement" with the lawsuit White filed, but said he is not the author. He added that he did not encourage anyone to file a case. "I have provided some information and insight to the commissioner over time," he said. "And I might have been the first person to mention (the legal concerns) to the proponents of this." Lee said he spoke with transportation tax supporter Jeff Vinik in June about the referendum. Vinik and his companies invested $700,000 in the initiative. The senator said he told Vinik the referendum would have to do an audit. Lee said he also told Vinik to look at Florida Statute 212, which describes the law for sales surtaxes. Lee said he also shared these concerns with his former chief-of-staff Ron Pierce, a Brandon-based lobbyist who works with Vinik and other supporters of the tax. "They knew on June 25 they had potential infirmities in their charter language," the senator said. Vinik declined to comment. His office confirmed he spoke with Lee in June, but said the senator never mentioned issues with the charter amendment, only the required audit. At their first meeting since the lawsuit was filed, the Democratic-controlled Hillsborough County Commission on Wednesday made it clear it sees no reason to put the brakes on the voter-approved tax. Commissioners instructed county staff to identify road and sidewalk projects that could be begun in 2019 with the new revenue. They also want an inter-local agreement with the county's three cities and bus agency on how to work with the oversight committee. More than half a dozen residents attended the meeting to express their anger over White's lawsuit. "It's a public disgrace that a sitting commissioner would oppose the will of the people of Hillsborough County," said Gerard White, a Tampa community activist who voted for the tax. "I want this commission to use every avenue in your power to fight for what the people have voted for."